Here in Ireland we're still waiting for summer to arrive. I don't know about you guys but I haven't a clue what to be wearing these days. It's summer so I want to wear pretty dresses and skirts and shorts but it's feckin freezing out most of the time so unfortunately I am still pretty much wearing my winter wardrobe. 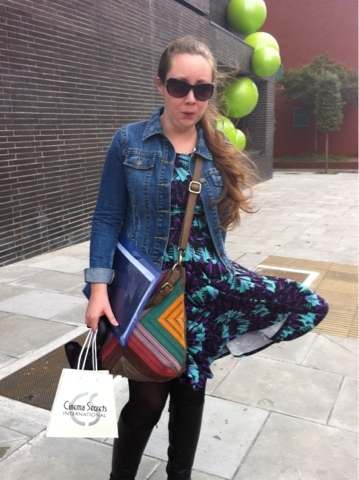 Enough is enough - so last week I decided to wear my new Cynthia Rowley dress to cheer me up. I was drawn to it the second I saw it in TK Maxx - the purple and aqua green is a match made in heaven, plus its a dress that can easily transition between summer and winter, given the right accessories. It was an absolute bargain at €26.99 too. Since it was freezing out and windy, I teamed it with my Rockport boots, black tights, my Warehouse denim jacket and my Fossil bag. 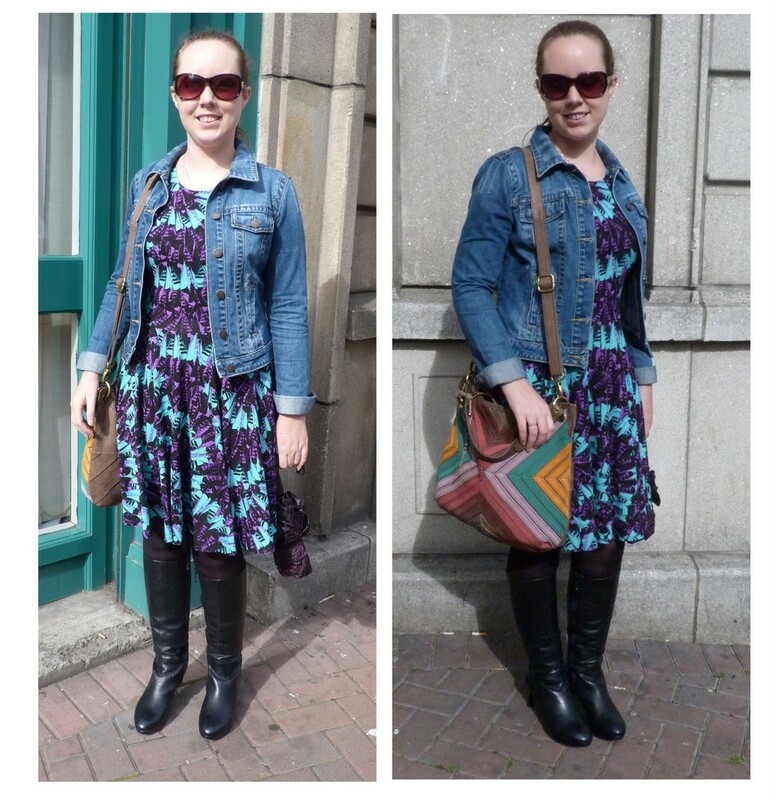 It wasn't until Karen was taking the photos did I realise the dress, boots and bag were all from TK Maxx! It's gorgeous on you Jo, loving the colours! Bit of Marilyn Monroe at the end ;) Love the bag! It's so true that wearing something pretty and summery can put you in a good mood! This week at work, I have been wearing really bright, colourful dresses to try to get me out of my work-funk. Today I am wearing a crazy-coloured Aztec-patterned dress over tights... probably slightly inappropriate for my corporate-policy job, but it's making me happy! Bargain of the week thanks to TK Maxx! Chit Chat Juicy Lipsticks - bargain of the week! Zoya Kiki - put your sunglasses on for this post! My most favouritest things in June!